So here we are. The most awkward antivirus review ever. I mean how do you review a security platform that was accused of being a proxy for an unfriendly government just one year ago? Kaspersky Lab denies the allegations, but regardless of what the truth is, the accusation is out there. Now, one of the first things many Americans think of when it comes to Kaspersky is Russian espionage. The reality is we have no way of ascertaining the truth so we’re going to do our best to set aside the controversy. This review is not going to weigh the spying accusations into the score. 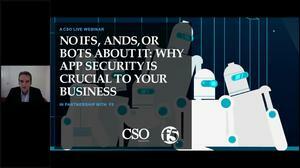 We’ll look at this suite like we would any other, and then leave it to you to weigh the other considerations—though we do have a helpful article on the Kaspersky controversy with advice from experts. For years, Kaspersky Lab has been one of the best names in computer security. 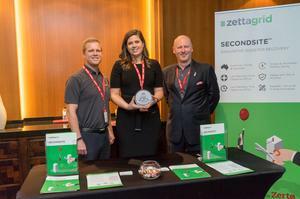 The company’s top-tier product for consumers right now is Kaspersky Total Security. Taking a look at the dashboard it’s easy to see why Total Security is so popular. The initial dashboard in Kaspersky 2019. The program is very easy to understand. 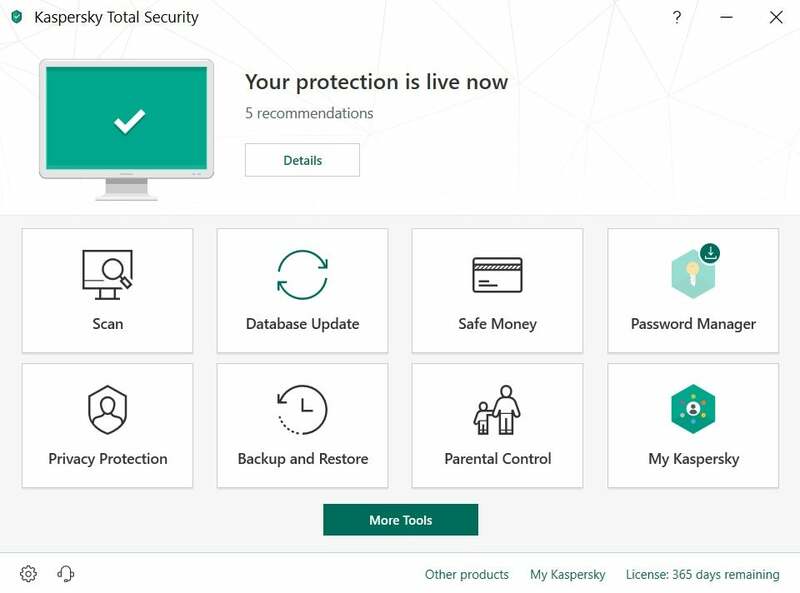 There are eight basic options Scan, Database Update, Safe Money, Password Manager, Privacy Protection, Backup and Restore, Parental Control, and My Kaspersky. The most important feature is of course Scan, which offers all the various features you’d expect. You can do quick and full scans, a selective scan that looks at specific folders, and an external device scan for USB drives. Of all the dashboard features, the one that might cause some confusion is Safe Money. 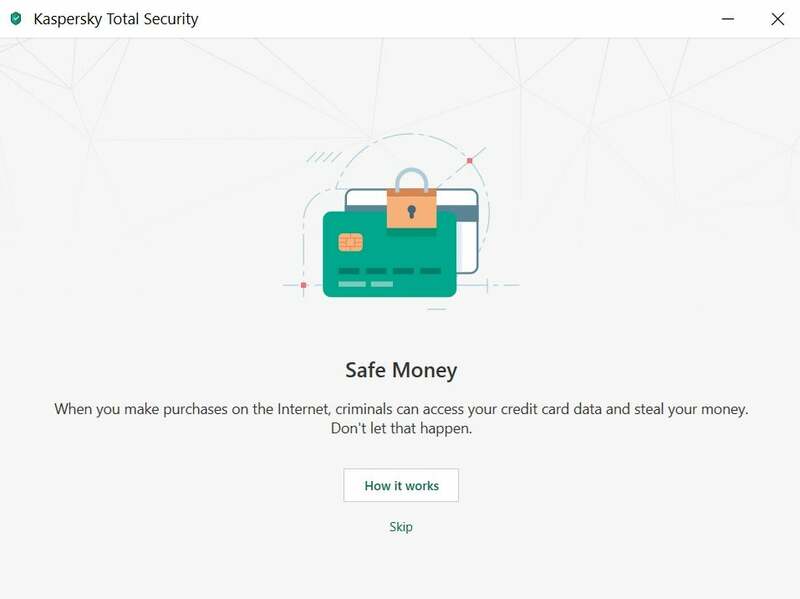 This is Kaspersky’s version of a dedicated, sandboxed browser, called Protected Browser, that separates your online financial activity from the rest of your system. This can include everything from logging in to your bank to purchasing something on Amazon. When it’s active, Safe Money automatically adds bank or payment system sites to its local database as you visit them. A pop-up then appears offering to open the site in Protected Browser. A new improvement in Total Security 2019 lets you open a site directly from the notification area. There’s also an option to manually add other sites if you’d prefer to use them with Protected Browser. You can also use an on-screen keyboard to type in account and password details to protect against any potential keyloggers lurking in your system. The password manager in Kaspersky 2019. Password Manager is included in the Total Security subscription, but you have to download it separately. It’s a very nice-looking password manager with all the features you need such as website logins, app passwords, password generator, banking data storage for auto-filling payment forms, and secure notes. Power users will enjoy the image-upload feature, which helps you keep important information from screenshots or other images in an encrypted database. There’s also a contacts database if you need it. 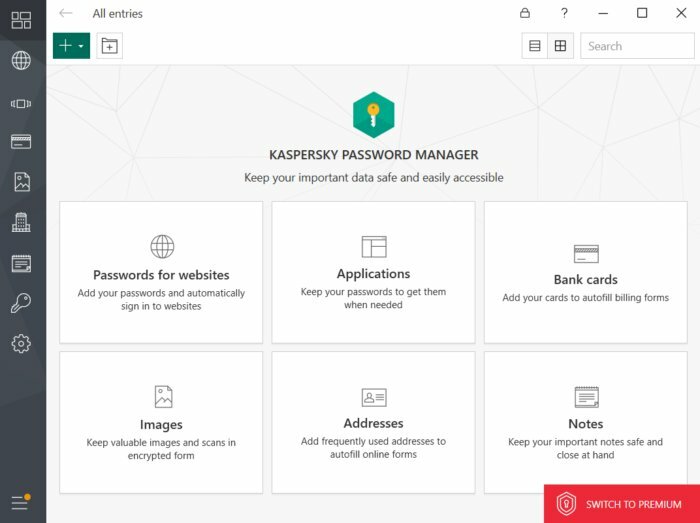 Kaspersky’s password manager is available for Windows, Mac, Android, and iOS. Privacy Protection is an interesting feature that summarizes blocked attempts at online data collection via a browser plugin. There’s also a webcam control option that prevents unauthorized access to your webcam. Each of these options also has a helpful How it works button so you can more easily understand what’s going on and why it’s important. Kaspersky’s Parental Control is focused on controlling child accounts on the PC, what they can access, and for how long. Total Security 2019 can now treat all similar apps as one. If you restrict web browsing, for example, no one can do an end run around it by browsing in Opera instead of Chrome. To control activity on other devices, you have to turn to My Kaspersky, which requires you to register with the My Kaspersky web service. Once that’s done, clicking on My Kaspersky sends you to a web app to manage multiple devices if they have Kaspersky installed. From the web app you can monitor a registered device’s location, social network activity, and get real-time alerts for suspicious activity. There’s also a controversial mobile communications feature that lets you monitor your kids’ incoming and outgoing phone calls and SMS messages if they own an Android device. 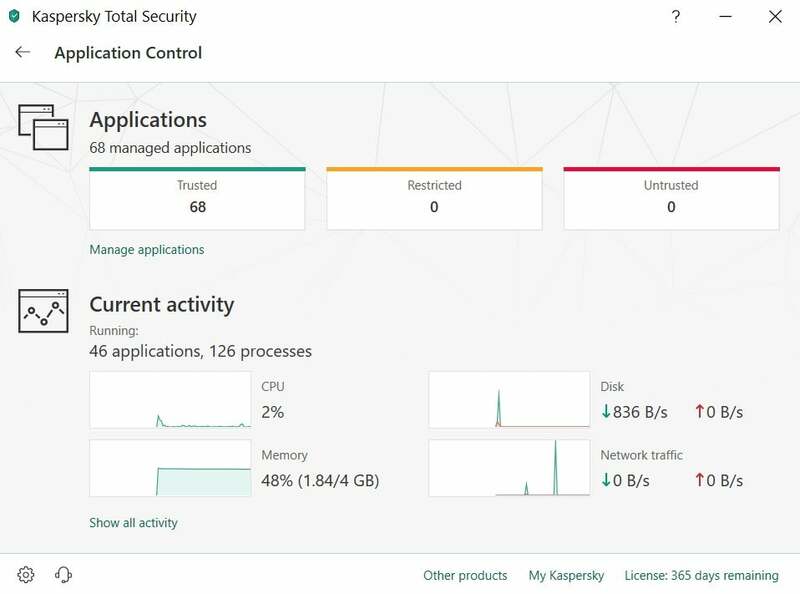 Going beyond these basics of the Kaspersky suite, if you click More tools at the bottom of the primary dashboard you can take a deeper dive into your system. The Tools screen in Kaspersky 2019. 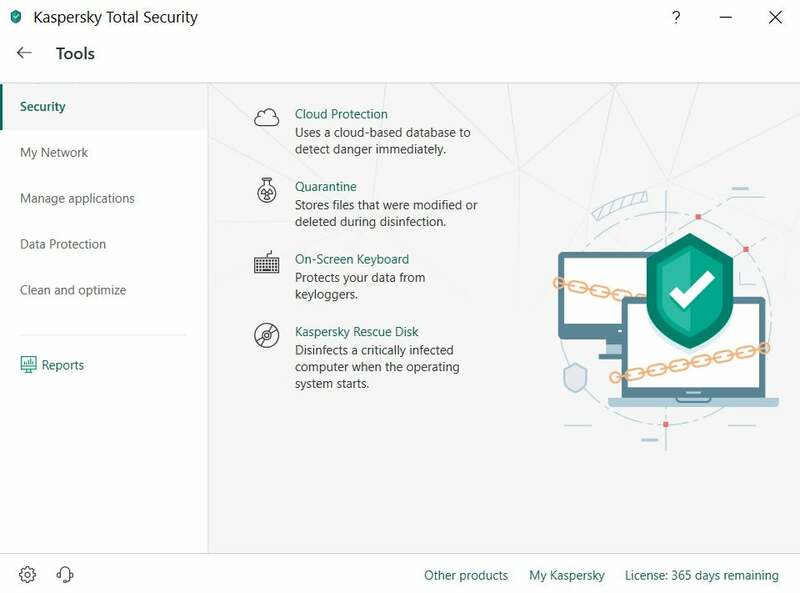 This section of Kaspersky Total Security received the most notable overhaul for 2019. The new look is much cleaner with a simpler navigation column on the left rail, with major categories such as Security, My Network, Manage applications, Data Protection, Clean and Optimize, and Reports. Then in the window’s primary space you can see all the various tools Kaspersky offers. There aren’t any new tools here. It’s pretty much the same as it’s always been; however, the organization of this section is much easier to grasp and less overwhelming. In earlier versions of Total Security, the first thing you’d see in the Tools section were some interesting graphs displaying current CPU and memory usage, as well as a network monitor showing current up and down bandwidth usage. These features are still there, but they aren’t automatically displayed. Application Control in Kaspersky 2019. The CPU and memory usage, for example, is under Tools > Manage applications > Application Control, where you get a nice full-screen look at the trust state of apps on your PC, and your current usage activity. The network monitor looks a little less friendly and is under Tools > My Network > Network Monitor. Most of the tools here are standard for premium security suites. There’s a software updater to keep your desktop apps up to date, and the improved version for 2019 includes the ability to schedule regular searches for app updates. An updated PC Cleaner allows you to search for and remove browser extensions without opening each browser. There’s also a file encryption feature, and quick links to Kapersky’s VPN, the on-screen keyboard, quarantined files, and file shredder. Another nice feature is the vulnerability scan under Tools > Manage applications > Vulnerability Scan, which tries to detect any potential ways your system could be exploited. The vulnerability scan is also available as an option under Scan > Scan schedule. 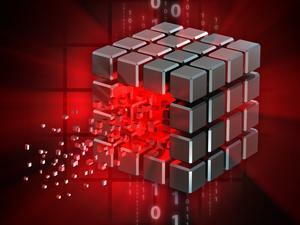 Overall, Kaspersky Total Security is very easy to use and understand. It doesn’t overwhelm you with features, but it has more than enough capability for powers users who want all the extras. Total Security 2019 costs $50 for up to five devices for a single year for new subscribers, and $75 for 10 devices. The MSRPs are $50 and $75 respectively. That pricing is a lot better than it used to be and puts Kaspersky’s cost closer to its competitors. It’s still more expensive than many other popular suites that charge about $100 to cover 10 devices. Kaspersky 2019’s Safe Money 2019. Kaspersky is recognized as having one of the best detection engines in the business, and the results from testing houses show it. Kasperksy Internet Security—the lower-tier suite, which has the same detection capabilities as Kaspersky Total Security—scored 100 percent in July and August 2018 in A-V Test’s 0-day and web attacks test, as well as the standard malware test. In A-V Comparatives’ August 2018 real-world protection test, Kaspersky scored a 100 percent detection rate of 193 samples with zero false positives. In the March 2018 malware protection test from A-V Comparatives—the most recent test published in this category at this writing—Kaspersky 2018 scored 99.98 percent for its online protection rate. 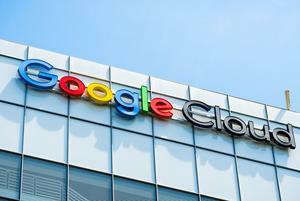 The company’s detection engine had nine false alarms, which ties it for fifth place in that regard with Avast and AVG. Avira and Eset, meanwhile, only had one false alarm each in the March tests. Kaspersky also earned a AAA rating from SE Labs in the testing firm’s April through June 2018 report. As for our in-house tests, Kaspersky had no impact on performance using the PCMark 8 Work Conventional test. Prior to installation, the test PC scored an average of 2,491 from three runs of the test. After Kaspersky was installed that average score increased by one point to 2,492. Larger is better with PCMark, but the difference is too small to matter much. 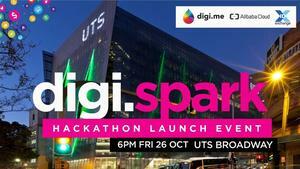 All tests were performed offline. As for the Handbrake test, the test PC took the usual one hour and 15 minutes to convert a 3.8GB 1080p MKV file to the Android tablet preset. With Kaspersky installed, the time stayed the same plus or minus about 30 seconds. The bottom line is that Kaspersky should have near zero impact on your PC’s performance, though on low-range machines there might be a slight performance impact under heavy loads. 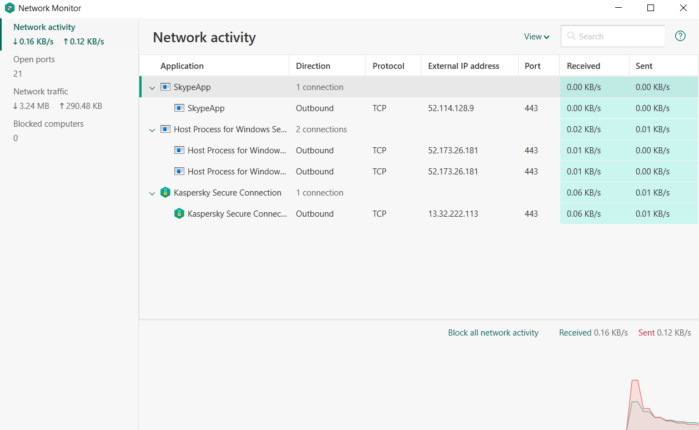 The Network Monitor in Kaspersky 2019. There’s no question that Kaspersky Total Security is a fantastic antivirus suite. It’s well designed, has all the features you’ll need, and performs well. For that reason I gave Kaspersky Total Security four out of five stars. But what to do about those accusations that came out in 2017? That’s a decision everyone has to make for themselves. When we first looked at the Kaspersky controversy, several security experts said that for most people the Russian government would not be part of their threat model. In other words, the allegations, if they’re true, would have little impact on them. If you work in a sensitive industry such as civic engineering or aerospace, definitely weigh the risks and the rewards of using this suite. Perhaps even get some guidance from your employer, especially if you’re prone to bringing your work home and putting it on your personal machine. If you’re just a regular Joe or Jane looking for a good security suite, it’s up to you to weigh the news (or not) against what is, on its face, an excellent security product.